Important Note: For using with PS4, the output sound for Left and Right chanel will be Reversed as the sound sampling rate of our audio adapter(192K/24BIT) is higher than PS4 Compatibility(48K/16BIT). 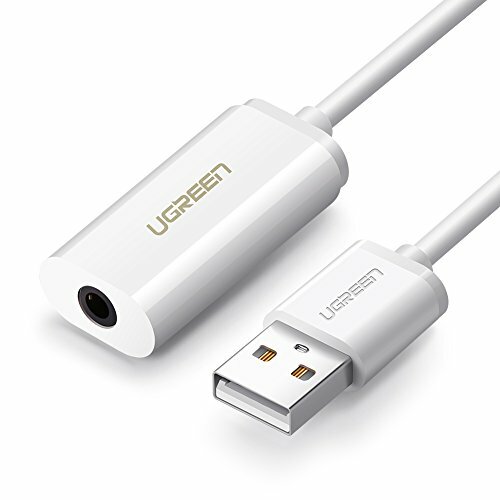 Additional USB stereo audio adapter: It is perfect to bypass a faulty sound card, audio port, or as a replacement for a broken USB audio adapter. Superb Sound Quality: USB External Stereo Sound Adapter adopted Advanced C-Media IC technology for optimal sound quality and device performance. It is constructed of durable ABS housing and with ultra compact design. Easy to set up: no driver required, just plug and play! USB bus-powered, no external power required. Wide Compatibility: This usb headset adapter works with any standard USB Audio Class enabled system including Windows 10/8.1/8/7/Vista/XP, Mac OS X, Linux, and PS4, Google Chromebook, Windows Surface 3 pro, Raspberry Pi etc.